Viet Nam is facing a dual burden of malnutrition and obesity, as its rapid development over the past two decades has resulted in the emergence of developed-world health issues without completely eradicating hunger. At a recent press conference, the National Institute of Nutrition’s Micronutrient Department deputy head Tran Khanh Van said that families should take care of children’s nutrition very early in their lives. Even before a woman becomes pregnant, her nutrition status can affect her baby’s life later on. “Ensuring adequate nutrition during the first 1,000 golden days of a child’s life, from pregnancy to age two, has played an important role in children malnutrition prevention,” said Van. “Ensuring the right nutrition for a mother during pregnancy will help a baby develop well in the womb and ensure the mother has enough nutrients for feeding her baby later,” stressed Van. Van added that an iron supplement during pregnancy and after giving birth was recommended as a simple and effective way to prevent anemia and iron deficiency for mother and children. Families should diversify their foods and add foods that are fortified with micro-nutrients. Mother should breastfeed newborns early and exclusively for the first six months. Thereafter infants should receive complementary foods with continued breastfeeding up to 2 years of age or beyond, according to Van. A survey by the National Institute of Nutrition showed that the stunting rate for children under 5 was 23.8 per cent while the rate of underweight children was at 13.8 per cent in 2017. This means that one out of every four Vietnamese children under the age of five was stunted or malnourished. Meanwhile, overweight and obesity have increased rapidly, mainly in the two big cities of Ha Noi and HCM City. Nationwide, nearly 30 per cent of primary school children are overweight or obese. According to results of the 2014-2015 survey, the prevalence of obesity among primary school children in HCM City was 38 per cent while in the inner city of Hanoi was about 18.5 per cent. The increased number of overweight children can be attributed to an inactive lifestyle and excessive consumption of low nutrition, high-fat foods such as fast food and soft drinks, said Dr Le Danh Tuyen, director of the National Institute of Nutrition. 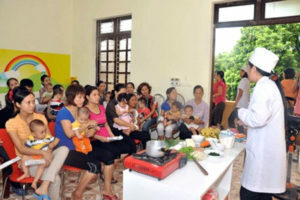 Meanwhile, the reason for the high percentage of malnourished children is the traditional diet of most Vietnamese, which does not provide enough vitamins and minerals for the children’s physical, mental and intellectual development, Tuyen said. The Nutrition and Development Week is taking place nation-wide with a focus on taking care of nutrition for mothers and for children during their first 1,000 days of life. A week-long communication campaign was launched nationwide on October 16 in efforts to strengthen community awareness on nutrition safety and malnutrition prevention in people, especially children, and on a healthy and balanced diet; ensure food hygiene and safety; and promote a healthy lifestyle through regular physical exercise to prevent obesity. In 2025, Viet Nam set goals to reduce children malnutrition, especially stunting rate to less than 20 per cent and obesity rate in adults under 12 per cent. Hi, unfortunately the data in this article are not correct. First, the title and first line suggest that malnutrition and obesity are two different conditions, which combine to form the double burden. Obesity is of course a sub-set of malnutrition. The term “malnourished” is incorrectly used later on.